These are the last of the cards from my weekend retreat with my Stampion’ Team! I love this cute card was designed by Laura Perriera! This cute little elf is so sweet The elf’s legs are made with the Season of Style Designer paper. The feet are made by cutting a top note die from Cherry cobbler card stock. The bows on the elf shoes are two butterflies punched from gum ball green card stock. The butterflies are cut apart and layered to look like bows. The bows are made from the silver taffeta ribbon. And to finish it off, the bells are punched from silver glimmer paper using the small scallop punch. This last card was designed by Deanna Czarniecki who is one of the most creative people that I know!! 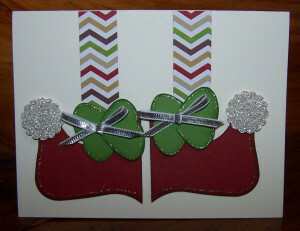 This card is designed around the Festive Flurries stamp set and matching framelits. The card base is smokey slate. This card is a gate fold card so is scored at 2 1/8″ from each end of the card base. She layered a piece of whisper white card stock on the inside of the card and stamped the small snowflake in coastal cabana ink. Deanna stamped the small snowflake with coastal cabana ink and the medium snowflake with smokey slate ink. She then cut these out with the framelits and also cut out a large snowflake from coastal cabana and the medium snowflake from smokey slate card stock. 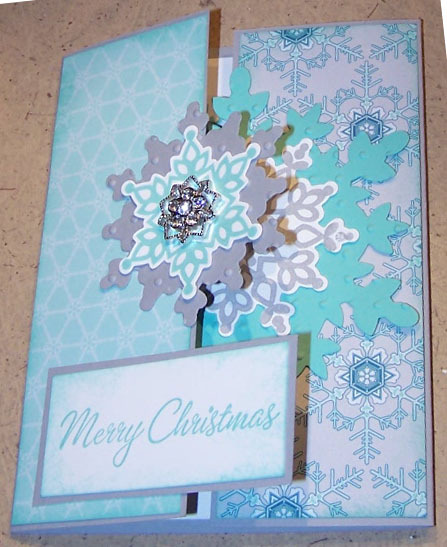 She added texture to these snowflakes with the polka dot embossing folder. 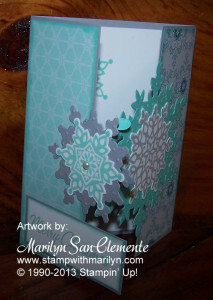 To layer the snowflakes, start with the large snowflake in coastal cabana and attach to the right half of the card. NOTE: Don’t add adhesive to the whole snowflake. Just the side you are attaching to the card! Then layer the snowflakes stamped in smokey slate on top of the large snowflake. Next on the left side start with the smokey slate snowflake and layer the coastal cabana stamped snowflake to the top. Deanna added a pearl jewel to the center of her top snowflake. I used one of the frosted flurry embellishments. Simply Beautiful!! cards, Christmas cards, handmade cards, Stampin' Up!. Bookmark. Tonight I have a card for you that I had a lot of fun making. Anytime I get to use my Big Shot is fun for me and this has several Big Shot elements. I used a sketch from MoJo Monday and the colors from Color Throwdown.